The skid control ECU receives the signals from the ECM, steering angle sensor, and yaw rate and acceleration sensor via the CAN communication system. With the IG1 terminal voltage 10 V or more, after the output of data from the skid control ECU is completed, the sending continues for 5 seconds or more. With the IG1 terminal voltage 10 V or more, a delay in receiving data from the yaw rate and acceleration sensor and steering angle sensor continues for 1 second or more. With the IG1 terminal voltage 10 V or more and the vehicle speed 15 km/h (9 mph) or more, data cannot be sent to the ECM for 2 seconds or more. With the IG1 terminal voltage 10 V or more and the vehicle speed 15 km/h (9 mph) or more, data cannot be received from the ECM for 2 seconds or more. With the IG1 terminal voltage 10 V or more, data from the yaw rate sensor cannot be received for 1 second or more. With the IG1 terminal voltage 10 V or more, data from the acceleration sensor cannot be received for 1 second or more. With the IG1 terminal voltage 10 V or more, data from the steering angle sensor cannot be received for 1 second or more. 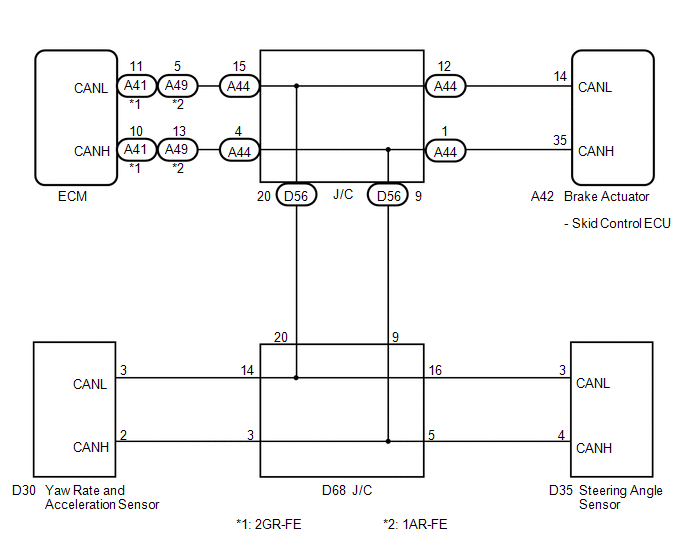 If CAN communication system DTCs and the relevant sensor DTCs are output simultaneously, troubleshoot the relevant sensor DTCs (for ABS and/or VSC system) after the CAN communication system returns to normal. (c) Check for any momentary interruption between the skid control ECU and each sensor or ECM (See page ). (f) If ABS and/or VSC system DTCs are output, record them (See page ). The CAN communication system must be normal when performing troubleshooting for each sensor DTC (for ABS and/or VSC system).